The San Francisco area has a unique and many would say ideal climate. It has wet winters (fitting in with more of a Mediterranean Climate) and very dry summers. In fact, the average direct precipitation for the months of May, June, July, and August combined is less than one inch. This is unfortunate for would be gardeners or tree planters, as almost all growth for most gardens and deciduous trees takes place during those four months. This has meant that gardens and newly planted trees have needed irrigation or hand watering by homeowners in the San Francisco area. This has become increasingly difficult to do with the drought that most of California is experiencing. 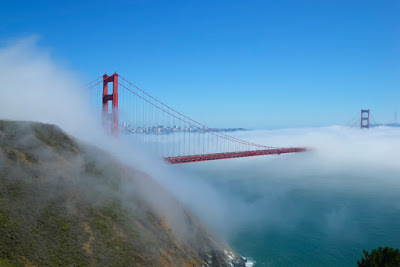 San Francisco, however, has a unique form of precipitation that is widely known but rarely recognized - fog. San Francisco averages 108 foggy days every year, on average, or almost a third of the year. This fog usually is deposited in such a thin layer on the soil that it quickly evaporates after sunrise. However, a new device is changing that. A device called the Groasis Waterboxx Plantcocoon®, or Waterboxx for short, is able to collect and store this fog. The Waterboxx was designed to grow trees in deserts or in areas bordering deserts, and to accomplish this goal it takes advantage of many techniques first developed by nature. One of these techniques is the Lotus Effect. The lotus leaf, in nature, exhibits a property called superhydrophobicity, roughly translated as extreme resistance to water sticking. The lotus leaf has this property because of tiny pyramids on its surface that prevent water molecules from attaching to each other. The lotus leaf does this to keep dirt, bacteria, and fungi from sticking to its leaves. You can see this illustrated below. Graphic by William Thielicke showing pyramidal structure of the surface of the Lotus leaf. This surface guarantees that water won't stick to the surface of the lotus leaf, or the Groasis Waterboxx lid that has similar microscopic pyramids on its surface. 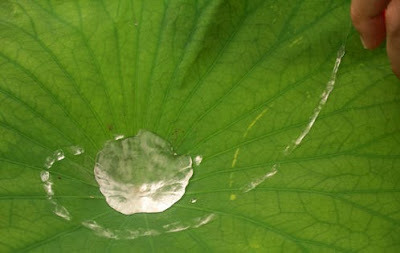 When we zoom out again to see a lotus leaf on the visible level, you can see how well it repels water, as below. How does the Waterboxx uses this lotus leaf property, and how can this help people garden and plant trees? 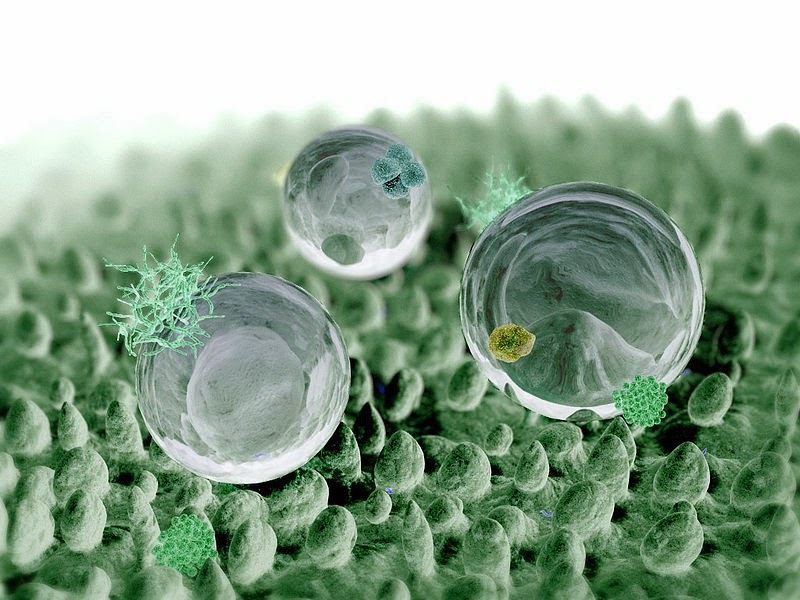 The Waterboxx has a lid that is inspired by the lotus leaf, with microscopic pyramids preventing the water from clumping together and then evaporating. It is also sloped and corrugated, which directs all water deposited on it down to a siphon and into a reservoir for later use. In this way, dew and fog can be harvested every morning and stored for use by the plant. This allows trees and garden plants grown with the Waterboxx to go very long periods (and perhaps indefinitely) without manual watering. A close up view of the Waterboxx growing tomatoes. You can see how no water sticks to the corrugated, lotus leaf inspired white lid of the Waterboxx (except the rim). Dew and occasional rainfall kept this Waterboxx full from May planting until September, with no manual watering. The Waterboxx was designed to plant trees in the desert, and as designed can provide all the water a tree needs for over a year with no human intervention (watering) after set up. It allows you to plant bare root trees (available here), in the Spring, Summer, Fall and the San Francisco area Winter. These trees won't need any watering or work until they have almost outgrown the Waterboxx, at which point you lift the Waterboxx up and reuse it for up to ten years. The Waterboxx isn't just used to grow trees, but also can be used for any garden plant with a compact central stalk, like tomatoes, peppers, melons, and zucchini. 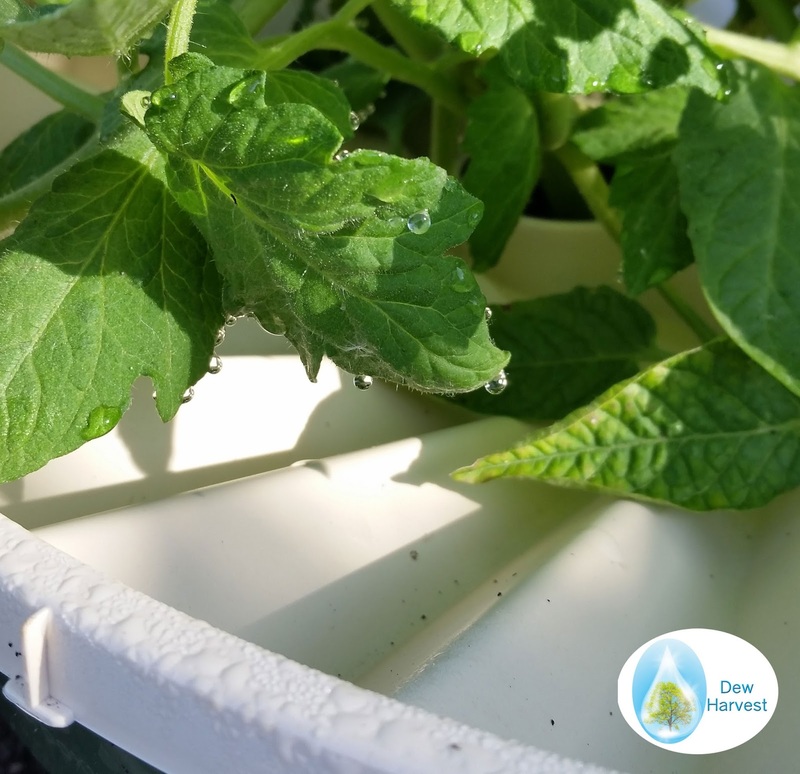 You can buy the Waterboxx or see it used to grow many plants on the Dew Harvest website here.